This torso of a standing Buddha statue from the 14th century in the northern Thai town of Chiang Saen is a world away from the realistic ancient Greek statue in the last post. 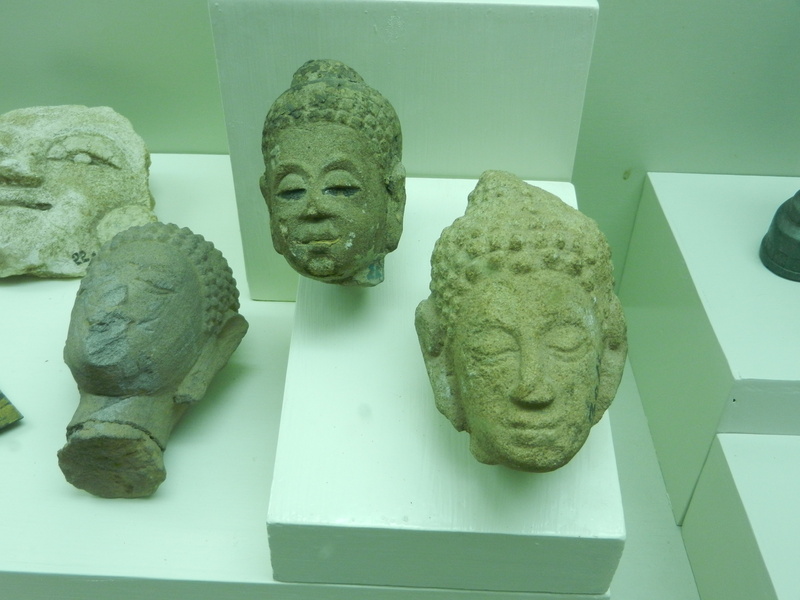 But Thai art is from a different world, which becomes more enchanting as you explore it. Instead of a muscled torso, the Buddha’s body is a smooth flow of graceful curves. And he seems pretty happy about it. The muscled dudes in ancient Greek sculpture reflect a culture in which people focus on each of the statue’s components, and its details. Most Westerners still look at sculpture and paintings in this way. 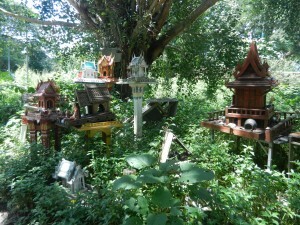 But in Thailand, the senses gently flow, rather than stop to analyze things. But this flow takes you from one enchantment to another without a single form to limit you. There are lots of graceful Buddha heads in town, and each one is a little different. Ditto for the bodies. 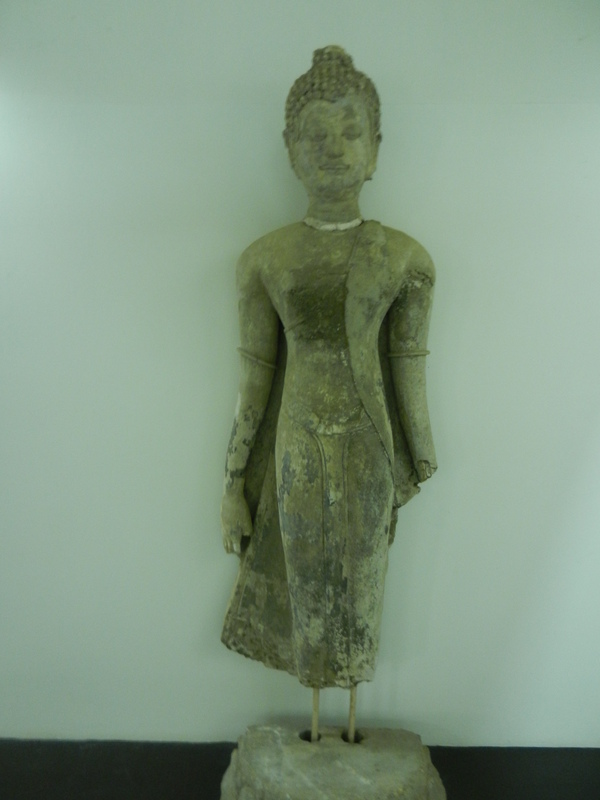 This standing Buddha from 1577 once held a begging bowl. 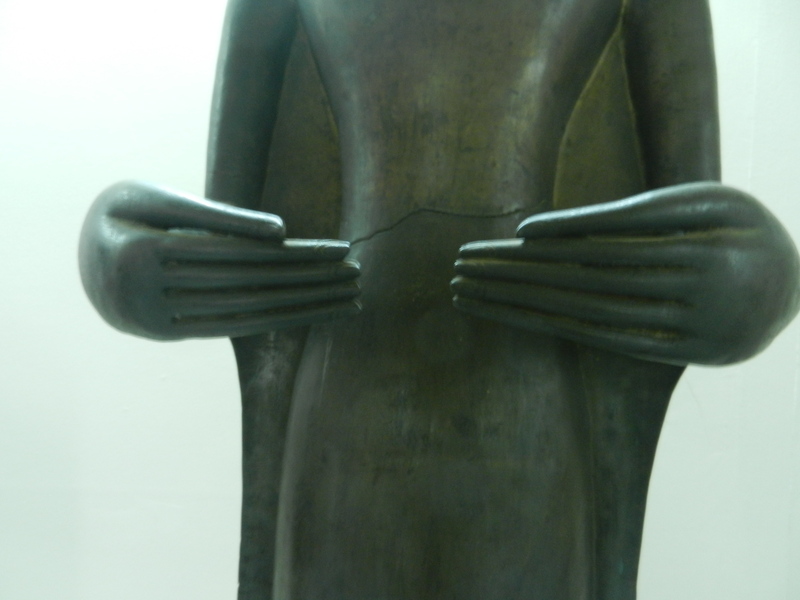 There are no straight lines–everything curves: hands, body and robe. 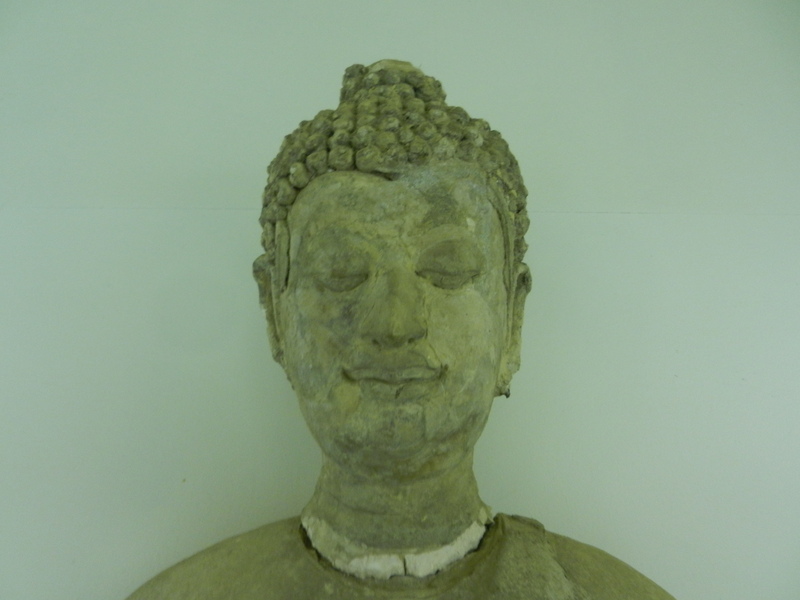 Tired of looking at Buddhas? 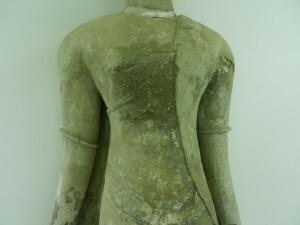 Many northern Thai towns that made ceramics from the 14th century on emphasized soft colors and flowing forms. 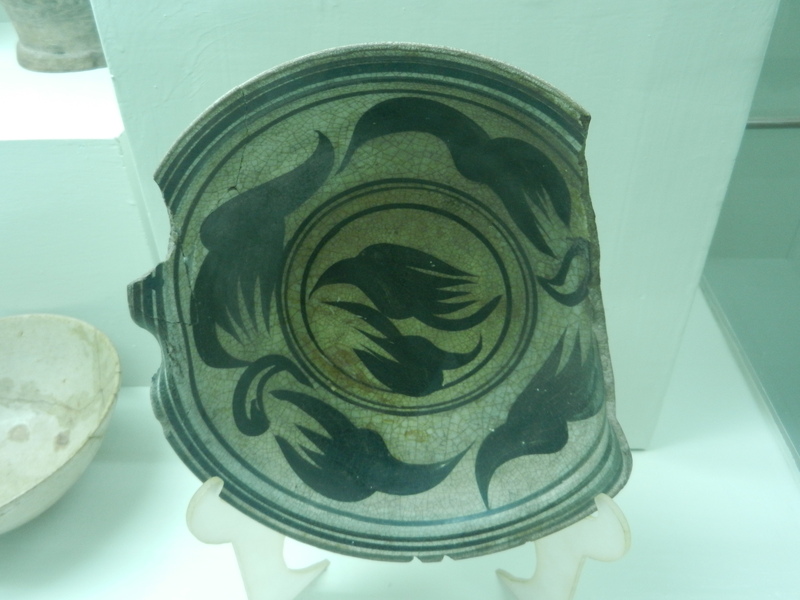 These forms were often playful, like the birds in the above bowl. 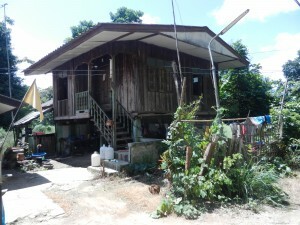 Many northern Thai homes are also in soothing colors. The dark teak and surrounding greenery blend into pleasing color schemes. Ceramics in some of those homes were equally enjoyable. Walk around a bit and you find more cool things. Lots of homes, wats and businesses have little spirit houses. This crowded neighborhood is just outside the city gate. People feel a need to provide extra protection for the community’s well-being there. But the lively and elegant forms of these little abodes gives their anxieties a beautiful side. 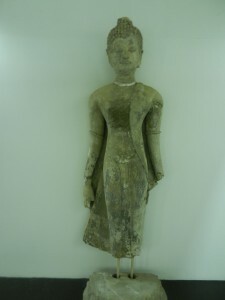 Chiang Saen is also full of shrines, and each has a unique form that’s so graceful that it seems to flow from the heavens. The spirit houses add a bit of spice to these subtler buildings. So the eye doesn’t stop at one place and analyze every detail. It gently flows, just like the rivers, religious processions and art forms that Thais have lived with since their formative period. As it meanders, it finds one enchantment after another. Which culture’s perspective is richer? Greeks can endlessly argue in their agoras, but they’ll never discover the subtleties of Thai ways of seeing without living in them. Thais can amble through their beautiful land, but they’ll never discover the richness of the Western tradition there. The world’s ecology of cultures is more wondrous than any single lens, and only a tiny fraction of it’s been explored.